Dogs don’t generalize which is why it is necessary to train in a myriad of places if one expects the dog to be reliable in a new environment. I don’t know why I didn’t consider that with the calves, but I didn’t. Being led around the pen with a halter and rope was vastly different from being willing to be led out of that pen and through the trees to the pasture. We finally had to tie one calf to a tree and the two of us finally managed to get the first calf to pasture and went back for the second. A task I anticipated taking less than ten minutes took closer to an hour and in the ensuing commotion I totally forgot about vaccinating the calves. So the next day back to the pasture with the halters I went, this time carrying syringes with the vaccines I needed to give. 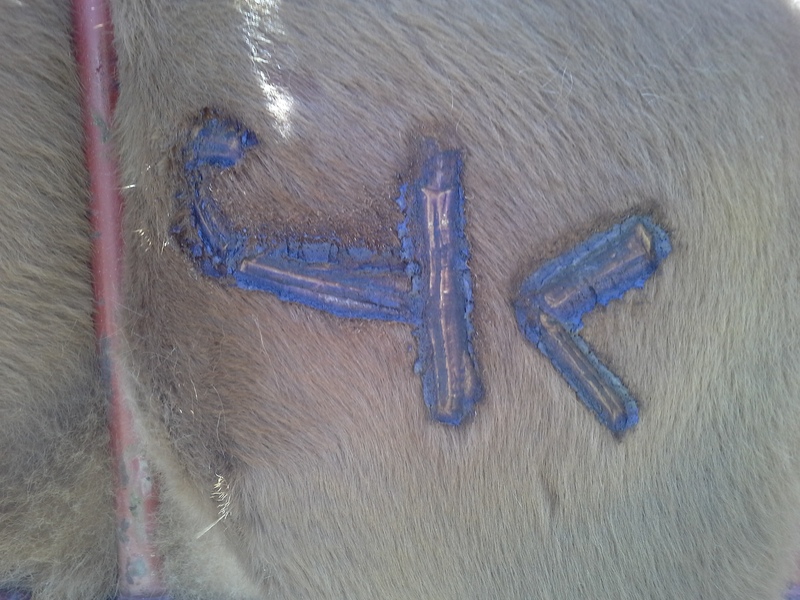 It goes without saying that these needed to be given sub-q instead of IM so rather than being able to simply jab the calves with the needle, I had to hold the calves with one hand and then administer a sub-q injection, through very thick skin with a very small needle, one handed. I’ve given a lot of shots but never under those circumstances and with luck will never need to do so again. Thankfully no one was around to see it as it wasn’t pretty. (I was thinking fondly of those huge spurs more than once.) I did finally get the job done and without damage to myself or the calves. Chalk one up for fools doing stunts, without being maimed or killed, that anyone with sense would know better than to attempt. 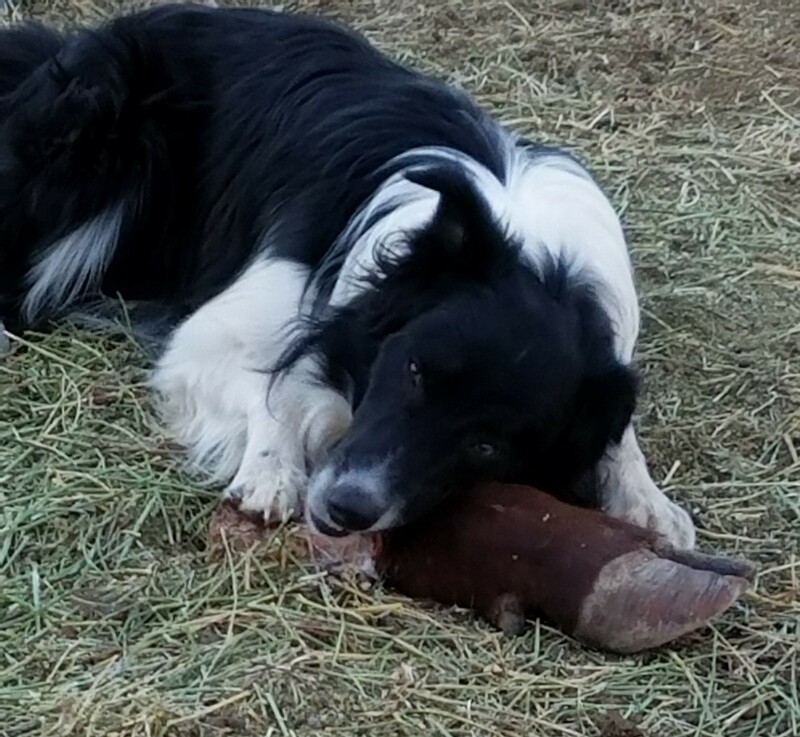 I had heard that coyotes generally steered clear of bigger animals such as cows, and since I had several people interested in buying grass fed beef, I thought that a couple of beef steers in the pasture might provide some protection for my goats. I therefore made arrangements with a local rancher to purchase a couple of beef calves after they were weaned. In August of 2008 I received a call asking if I would be willing to take a heifer calf and a steer calf as the two were bonded to each other. Not knowing any better, I didn’t see any reason why it would matter and we arranged to have the two calves delivered. I planned on putting the calves in the pen I had built to work goats for a couple of weeks before moving them out to pasture so bought a water trough that I could easily move to the pasture and set up the calves’ temporary home. The day arrived and a stock trailer pulled into my drive. The cowboy got out of the truck, spurs jangling, and asked where I wanted the calves off-loaded. I showed him where I planned to put the calves and he looked at me incredulously – there was no way to drive the truck and stock trailer to the working pen. I suggested leading the calves the 50 or so feet from the driveway. He laughed – these were range calves and half wild. But he had been told to deliver calves and deliver them he would. 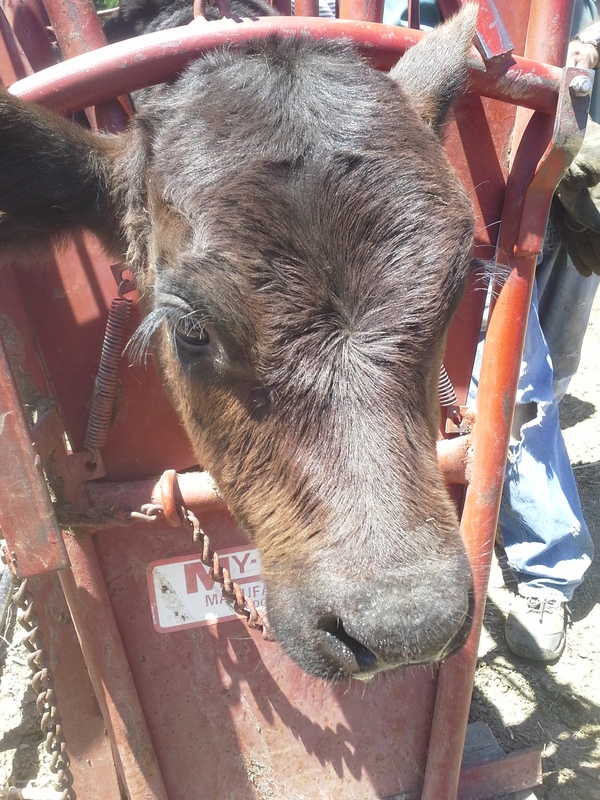 With me handling the gate to the trailer, he climbed in with a rope and lassoed a calf. The calf bolted for the gate and I slammed it shut as soon as the calf and cowboy cleared it, looking around to see the calf in the air and the cowboy, with his spurs dug into the ground being towed behind. I had thought him pretentious when I first saw the spurs, but now I could see the benefit of those huge spurs. Without the spurs holding him upright he would have had been eating dirt. By the time he had moved both calves to the pen I’m sure he was muttering unflattering comments about the idiot (me) who had bought the calves. Having seen the calves in action I knew there was no way I’d be able to get them out to pasture unless they were broke to a halter and lead so I duly bought a couple of rope halters and set to work. The first step was just getting the calves used to me being within twenty feet of them without them running. Initially when I would provide hay and a little calf feed I would move off and stand quietly until the calves would approach the feed and eat. At first, any movement would send the calves running to the other side of the working pen but eventually the calves would continue to eat while keeping a wary eye on me. Slowly I was able to progress to being able to touch the calves and then the big day came when I put a halter on one for the first time. After a few days of being able to move the calves by holding some feed in front of them I figured we were ready to move out to the pasture. In preparation for the move I had picked up the vaccinations I needed from the local veterinarian so I could vaccinate them before they went on pasture. The teenage son of a friend came over to help. I figured if I led one calf and he led the other, we should be able to get the calves moved fairly easily. When I’m wrong, I am really, really wrong!